Small Dream Factory shares a free pattern on her blog for making a baby’s sleep sack. 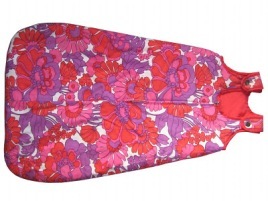 The sleep sack will keep baby warm while she sleeps, but unlike a blanket she can’t kick it off. The pattern is sized for babies 6 – 14 months. Get the free pattern. I can’t seem to get the FREE pattern for the sleep sack to download so that I can print it off, is there anyway that you would send it to my email address?